If you would like to support the Ely Choral Society, why not become a Friend? The valued donations that ECS receives from its Friends enable us to engage top flight soloists and orchestras as well as offering our Friends a range of benefits. These benefits include a 10% discount on two tickets for certain concerts, priority booking, free concert programme, complimentary wine at certain concerts and an annual Newsletter. 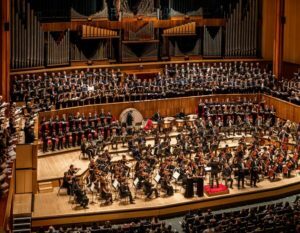 We also organise visits to prestigious London concerts. The coach left The Gallery, Ely for London at 10:00 am for a journey of around 2 hours. This gave everyone an opportunity for a leisurely lunch, or some sightseeing along the South Bank, or a visit to Tate Modern nearby before the concert.